Fender Rhodes, swirling Carleen voices and Spinna--one sublime joint. Not sure if the last vocal note of Spinna's mix gets me more than the entire tune; Spinna has such an ear for the right notes at the right time. I am beside myself, all fuzzy due to the heavenly sounds contained within. The Baseline sounds vintage Donna Summer, circa '78. DJ Spinna, Blaze, Kaidi Tatham, Carleen Anderson – Shall I draw you a picture? This is an amazing, uplifting, good feeling house classic, and one I’d certainly have on my mantelpiece, if vinyl didn’t melt that easily. 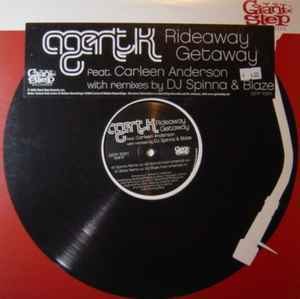 Carleen Anderson is blessed with that heaven-sent sweetness few possess in a voice, and I love what both DJ Spinna and Blaze have delivered musically. Imagine ‘Little’ Louie Vega wearing out his copies of Spinna’s mixes in next to no time, then kickin’ back to Blaze’s beautifully deep broken versions, while waiting for fresh copies to arrive…that kinda vibe!